2017 leaf season is HERE! Large 12 oz bag being sold and shipped for $18.50 included. These will come in first class parcel which will take 3 to 5 days to get to destination. They will be freshly picked and come in a large airtight ziploc bag. You may upgrade to priority shipping for additional cost or order other items with it that includes separate shipping fee. Due to the nature of shipping closed bag leaves, moisture may develop and the leaves may weep. If your area is very hot and humid, the leaves will rot easily during transit. You must take them out of the bag, give it a clean rinse, and place it back into airtight bag and refrigerate. 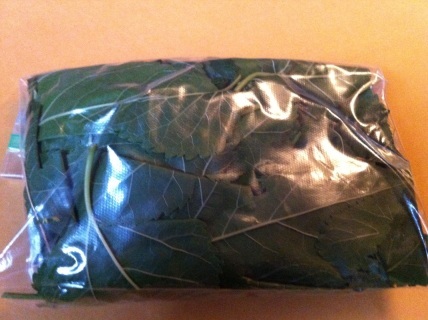 Depending on the condition of the leaves during transit, they may last up to 2 weeks in the fridge.